colonial America – Kristen D. Burton, Ph.D.
One of these days I will get around to writing a post about the whiskey dinner I attended at Mount Vernon. I want to make sure that, when I do write it, I devote the proper amount of time and attention it deserves. Luckily, my tasting notes keep better than my memory, so there will be plenty of details to lay out (once I do it, that is). In short, it was wonderful. 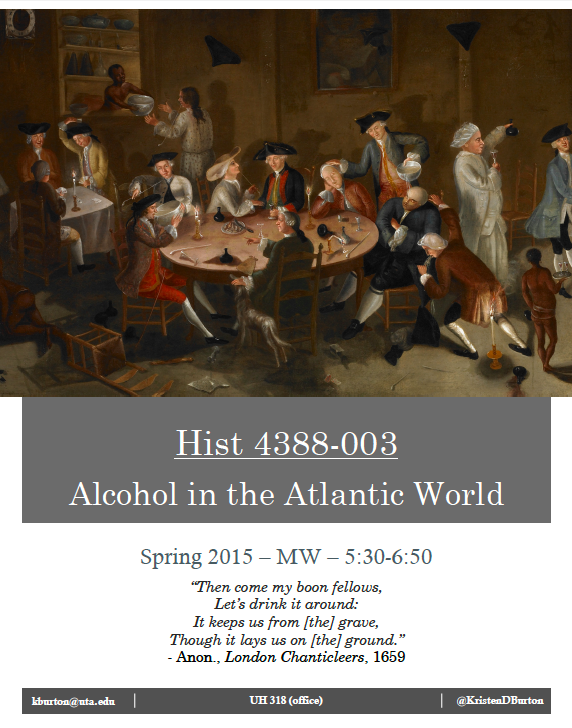 For now, however, I simply wanted to share an early flyer for my course on Alcohol in the Atlantic World, which will be offered next semester at UT-Arlington. Cue the sigh of disappointment – my apologies. A fair amount of Mount Vernon whiskey posts are on the horizon. I promise. This holiday weekend, as people across the United States celebrate the anniversary of the American colonies’ declaration of independence, many will do so by firing up backyard grills and enjoying cold, crisp bottles of beer. Beer is particularly popular in the United States at the moment, thanks to the rapid spread of innovative breweries across the country. Drinking also seems to go hand-in-hand with holiday celebrations, but there is a certain appeal to enjoying a cold beer on a hot July day. Though many likely stocked up on beer in anticipation of the holiday, what would the American colonists who supported the fight for independence drink? Probably not beer. I say probably, because beer was certainly available in the mainland thirteen colonies. The colonists, though, tended to have a taste for the stronger stuff, and they had plenty to choose from. Readily available ‘potent potables’ included (but were not limited to): rum, a variety of wine, cider, rum, brandy, whiskey, and more rum. Beer did flow through the colonies, but often tavern-goers opted for bowls of rum punch. They also mixed their own cocktails out of beer, adding rum and sugar to make a popular drink known as Flip. One part sour – which usually comprise of either limes or lemons. Two parts sugar to take the edge off the sour lime flavor. Three parts strong included whatever rum one had handy, though aged rum was preferred. 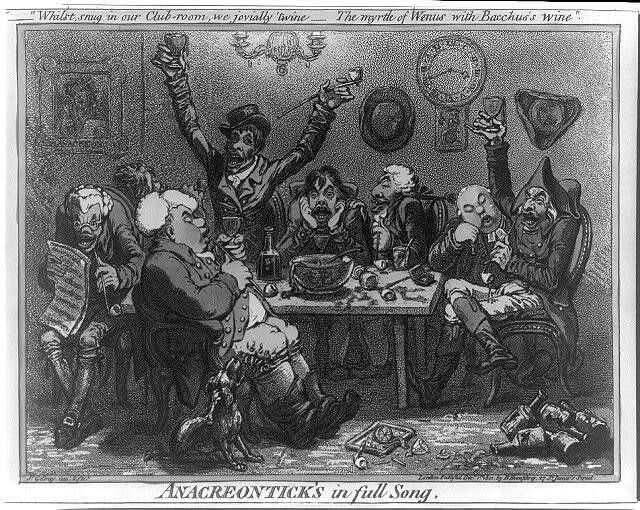 Four of weak included a mixture of water and ice, so tavern-goers could have more than one round before falling on the floor (though that did tend to happen). Greenwood, Sea Captains Carousing in Surinam, c. 1750s, via Wikimedia Commons. Rum punch was immensely popular, as shown in the number of illustrations that feature the rum punch bowl as the focal point (for both the viewer of the illustration and those depicted drinking in the tavern). The colonists would mix, and consume, this popular punch in great quantity. One recipe called for one quart of lemon juice, one quart of brandy, two quarts of rum, five pounds of sugar, and four to five quarts of water and ice. Harriott Pinckney Horry’s recipe provides an example of ‘elite’ rum punch, likely the kind enjoyed by the Founders themselves (not a far leap, as her brother was a Revolutionary War veteran and signer of the Constitution). 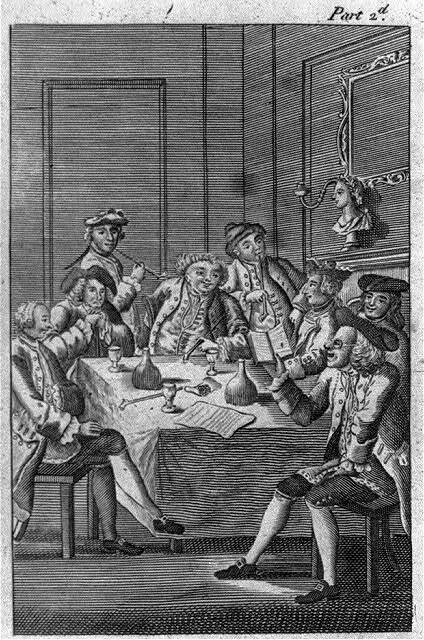 Historians have made much about the abundance of alcohol in the North American colonies, as well as the role drinking played in fueling the movement toward independence. Americans continue to celebrate this momentous day, and though the beverage of choice may have changed, the practice of pouring and enjoying a refreshing glass continues. Happy Independence Day! As always, enjoy that rum punch responsibly. Peter Thompson, Rum Punch & Revolution: Taverngoing & Public Life in Eighteenth Century Philadelphia (University of Pennsylvania Press, 1998). Ian Williams, Rum: A Social and Sociable History of the Real Spirit of 1776 (Nation Books, 2006).